Learning to Ride Comes from Inside…Your Dreams! Expert horsewoman Armgard Schörle shares innovative techniques that enables children of all learning levels to ride with confidence and self-awareness. Her latest book contains photographs and step-by-step instructions that can help make learning to ride a dream come true! In this easy-to-read instruction book, you will learn how a child’s dreams, fantasies, and desires are integrated into the process of learning to ride. A variety of ideas, including playful suggestions and effective exercises, help your child from their first encounter with a horse until the day he or she can ride independently. A child’s will is strong, and so are their imaginations! Practical, engaging and fun, Dreams of Horses will help kids everywhere learn and appreciate the proper techniques of horseback riding. 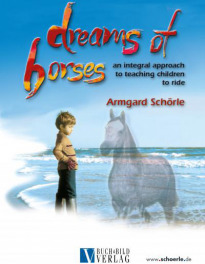 About the Author: Author Armgard Schörle has taught horseback riding to children and adults for nearly 25 years. She and her husband, Roland, have two sons, Nikolai and Antonio, and live on a ranch with their beautiful horses near Bodensee in Southern Germany.